This is the next article in our series on handling Rochester, Minnesota pedestrian accident cases. Our last article discussed how comparative fault impacts a pedestrian accident. A victim can still receive compensation even if he or she is partially at fault for an incident. 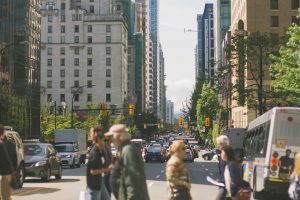 In this article we will discuss the handling of claims involving pedestrians and commercial vehicles, such as delivery cars, semi trucks, and taxi cabs. If you require assistance, contact our office today to speak with a lawyer. Employers are generally responsible for the acts of their employees. This includes employees who hit a pedestrian while operating a vehicle as part of their job duties. In addition to being responsible for the employee’s negligence, the employer itself can be found liable for negligent hiring, negligent supervision, or for other failures in training or oversight of its negligent employee. An injury case involving a commercial vehicle usually includes multiple defendants. Identifying all of the defendants in such cases is crucial. Determining who the defendants are in a pedestrian accident case involving a semi tractor trailer or company car depends on the specifics of the situation. No two cases are the same. When someone is hit by a commercial delivery vehicle, for example, the defendants may include the driver, the owner of the delivery vehicle, and the entities who contracted with the delivery service. It may be possible to identify some of the defendants through public records, such as those available through the Secretary of State’s office. It is not uncommon in these types of cases for additional defendants to be identified after a lawsuit is filed. Those parties typically can be added to a lawsuit. There are numerous intricacies in cases involving commercial defendants, which set them aside from those involving privately owned vehicle claims. More than the usual number of expert witnesses may need to be retained to establish that a company was not following the standards of its industry. Your counsel will be dealing with a separate attorney for each of the defendants. These are just some of the reasons why it is crucial to retain a Rochester pedestrian accident lawyer experienced in handling such matters. Our firm has recovered more than $125 million on behalf of victims and we are ready to assist you.